Register Your Book: What Those Words Mean - Ask Leo! 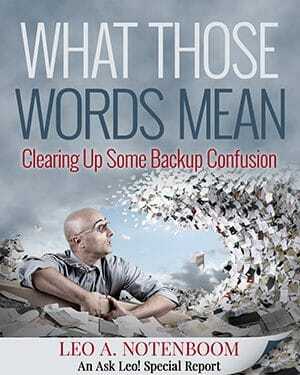 Thank you for your purchase of What Those Words Mean – Clearing Up Some Backup Confusion! If you purchased the book in downloadable PDF form directly from The Ask Leo! Store here at askleo.com, your book is already registered! Click on THIS LINK. This will add the PDF edition to your Ask Leo! Store shopping cart, and apply a 100% discount. You will not be charged for the book, since you already purchased it elsewhere. Check out normally. If you do not yet have an Ask Leo! account be sure to create one as you check out. If you already have an account be sure to login as a returning customer. That’s all there is to it. Once you’ve completed checkout you’ll have an Ask Leo! account. As long as you’re logged in to that account — using the My Account item at the top of the page — you’ll have access to the What Those Words Mean – Owners Page. If that doesn’t work click on the Lost your password? link. Enter your email address (carefully, again) and click on the Reset Password button. Check your email; within the next 30 minutes you should get a message with a link. Click on that link and you’ll be able to set a new password. Login using that email address and password. Still having trouble logging in or accessing the owners page? Thanks again for your purchase!